In the go-go 90s, the Internet was new and we were all excited about the potential of "webcams," a new technology allowing tiny images, almost-live, to be viewed online. Nearly twenty years after the advent of the technology, the bloom is off the webcam rose, and today the webcam landscape is a bit barren. But fear not, dear reader: I've combed through the remaining sites and collected 11 fun webcams for your amusement (and/or bemusement). Fire up Mosaic and follow me! One of the more technically impressive webcams is the Garden Bubble Cam. 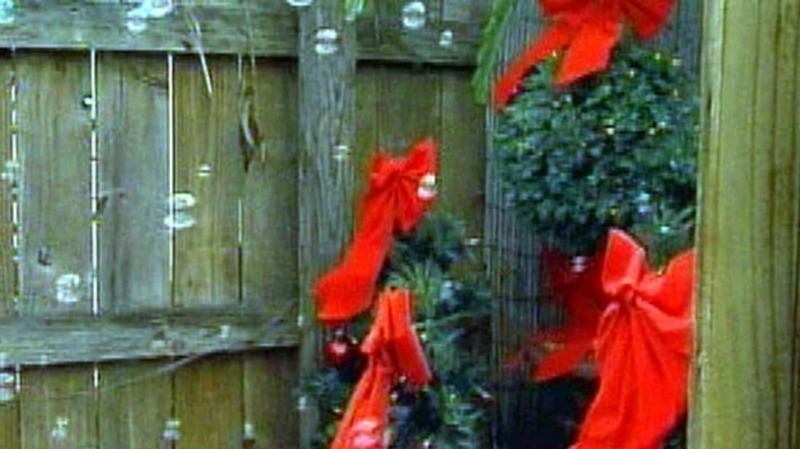 It requires you to enable a Java plugin (it took me three browsers and some fiddling to make that part work), then you click the "Bubbles" button and wait about thirty seconds...then you're treated to a live blast of bubbles on the back patio of a south Florida home! It really works! This cam looks into a London flat through a keyhole. In my viewing, I saw what appeared to be the corner of a room, with a light on, and nothing happening. Checking in a few hours later, I saw the same (apparently live) view. Enjoy the view of mostly nothing. As I pointed out recently, this is a spectacularly boring webcam: if we're lucky, a drop may fall within the next year. After that, we've got another dozen or so years before the next drop falls. Check it out! Photo from Wikimedia Commons: Picture of the Pitch Drop Experiment from University of Queensland featuring the current (2007) custodian, John Mainstone (picture taken in 1990), two years into the life of the 8th drop. This is the current situation outside of the County Treasurer's Office (updated every five seconds). The Treasurer’s Dept. will open to the Public Monday through Friday from 8:00 am until 4:30 pm except the last business day of the month will be 7:30 am until 5:30 pm at both office locations. There will be no processing of title work after 4:00 pm every day. This cam is impressive because there are definitely things happening (people sitting, reading, checking their phones, etc.) but it's also insanely boring. At least it's useful...if you're in Topeka and you want to know how much of a wait you'll have trying to get into Treasurer Larry Wilson's office. Get your hallway on. This cam shows videos of various lifeforms in water, under a microscope. The site also appears to be largely an ad for microscopes, but hey: watch out for tiny bugs! "Mr. Grass" has been providing a live view of his front yard (warning: music auto-plays) since 2005. It's surprisingly interesting, partly because the view includes part of his driveway and the street in front of his house, so you can see cars drive by. And, of course, the grass does grow (as evidenced by various screenshots throughout the years, lower down on the page). Be sure to check out the "Click for Super-Size!" button at the top of the site, and check out the Grass Blog for some notable events in the history of Mr. Grass's lawn. The Streaming LibertyCam is pretty impressive -- it has controls that allow you to zoom in on the statue, or take in a wider view. As I watched, two boats and two planes sped by, just past sunset. Check out the "Hall of Fame" shots below the cam for some great screen grabs. The Niagara Falls Cam uses the same technology as the aforementioned Statue of Liberty Cam, allowing you to zoom in. It periodically pans around to show different views of the area. I didn't spot anyone going over in a barrel, though. The Christmas Tree Treasures webcam follows the adventures of a 160-foot tall fir tree located in Blue River, Oregon. Around Christmas time, it's decorated with lights and such. During the non-Christmas season it's just, you know, a really big tree. The Canadian Space Agency provides the AuroraMAX camera, a view of the Northern Lights in Canada. Because the lights are only visible at night, and they aren't always that spectacular, this is sort of an "event webcam." Follow AuroraMAX on Twitter for tips on good viewing opportunities, and a gallery of movies shows some examples of past views. Just when you thought you were safe with boring cameras showing safe subjects, I had to expose you to the ultra-high-quality Roach Cam, a project of the University of South Carolina. It claims to have been online since 1993 (!). If you don't believe it's live, take a screenshot and then refresh the page, comparing the two images. Then squirm and freak out a little. Go on, I dare you.